To most folks this looks just like a regular pool table. 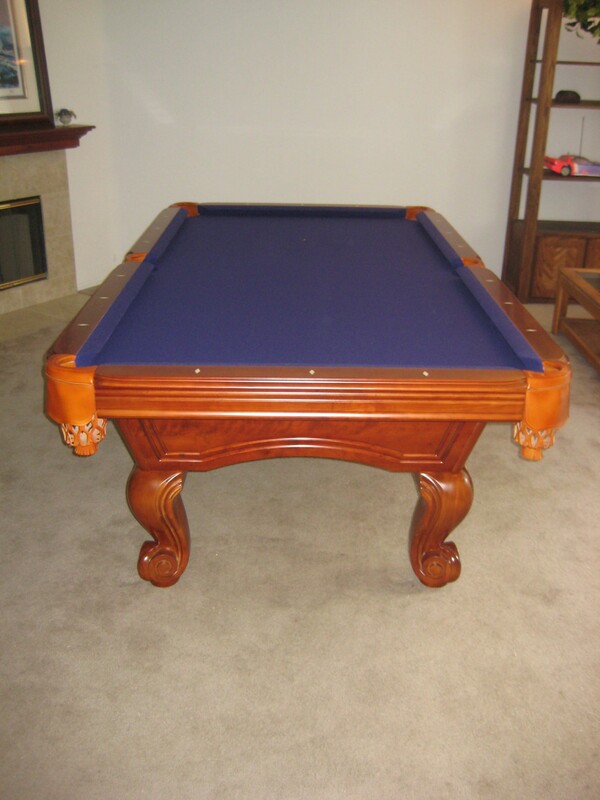 It’s an 8′ 3 piece slate pool table,an 8 footer that has leather pockets and carved legs. And, in that sense, it is a regular pool table. But, when we were called out to setup and refelt this pool table, we found that the three pieces of slate were all from different pool tables. The owner had never replaced the slates, so that means the table was purchased like this. Three piece pool table slate is traditionally diamond honed and cut from one large slab. The three pieces fit together perfectly because it was all once part of the same piece. But in this instance, each piece of slate was from a different matched set. It took us twice as long to get an accurate level as we set the pool table up, but I stuck with it and made it work. The owner understands why his table always played a little quirky from the beginning. And, now that the setup and refelt is complete the table looks and plays just like a professional pool table. Just like it should have when he bought it 4 years ago. Wow David, that’s a shocking read! It just goes to show even though we are in the UK and you guys are in the USA there are cowboy outfits selling pool tables everywhere. It’s so hard to find reputable dealers who know what they are talking about and aren’t just about making a fast buck. Very much enjoying your blog posts. Keep up the good work from one reputable dealer to another.